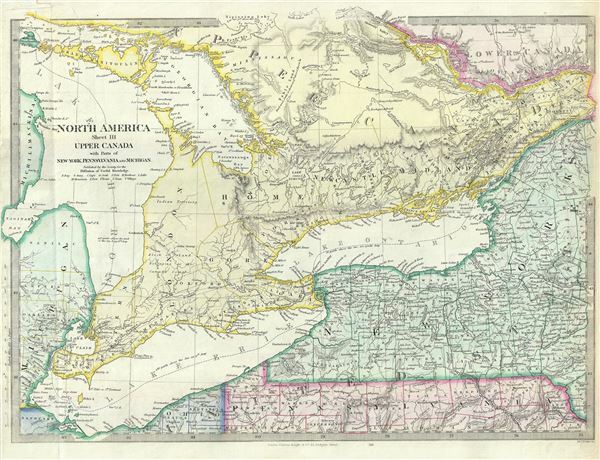 North America Sheet III Upper Canada with Parts of New-York, Pennsylvania and Michigan. This is an attractive 1848 map of Upper Canada or Ontario issued by the S.D.U.K. Centered on Lake Ontario, the map covers from Drummond Island in the United States to Vaudreuil. Three of the Five Great Lakes, Lake Huron, Lake Ontario and Lake Erie are included. Parts of New York, Pennsylvania and Michigan in the United States are also included. Canadian provinces and territories were under British and French control from the 16th century, until France gave up its claims in the Treaty of Paris in 1763. Canada would remain a collection of British colonies until its confederation in 1867, when the British Province of Canada was divided into Quebec and Ontario and the British colonies of New Brunswick and Nova Scotia incorporated as Canadian provinces. Very good. Blank on verso. Minor wear along original fold line. Minor verso repair at fold near bottom left margin. Bottom left margin includes original slit made during printing. Rumsey 0890.130 (1832 edition). Phillips (Atlases) 794.